HOA BINH (VNS) — Viet Nam should soon restructure its textile and garment industry by increasing competitiveness, and offering value-added products, stated Deputy Prime Minister Hoang Trung Hai. During his speech at an opening ceremony of Esquel Group's new garment factory in the northern Hoa Binh province yesterday, the deputy PM noted that apart from the six signed free-trade agreements (FTAs), Viet Nam was in the process of negotiating six others, such as the Trans-Pacific Partnership, FTAs with EU, and the Customs Union of Belarus, Kazakhstan, and Russia. Three of them were expected to be finalised in 2014, he remarked, adding that this was a historic time for the domestic textile and garment sector to restructure and be an integral part of the global production chain by producing hi-quality and value-added products. In order to achieve this goal, he called for greater efforts by the Government, ministries, local authorities, and the business community including the foreign-invested sector. 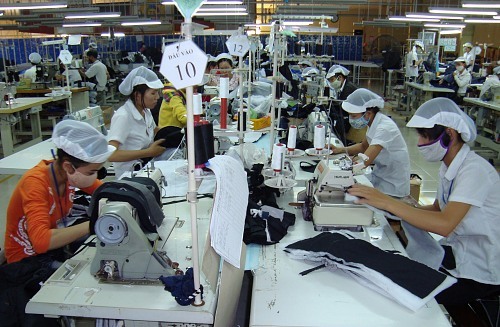 The Esquel Group Vice Chairman and CEO John Cheh stated that the US$25 million garment plant in Hoa Binh Province's Luong Son Industrial Zone was the group's third plant in Viet Nam, besides its existing facility in the southern Binh Duong Province and another factory in the neighbouring Dong Nai Province. The new factory with start operating at full capacity next year and will produce seven million hi-quality shirts annually for renowned international brands such as Hugo Boss, Tommy Hilfiger, and Muji and will provide jobs to 3,000 locals. He added that the group also planned to develop a fabric mill in Viet Nam this year.